During the week of February 8, 2018, the average rate for a 30-year fixed home loan rose to 4.32%. 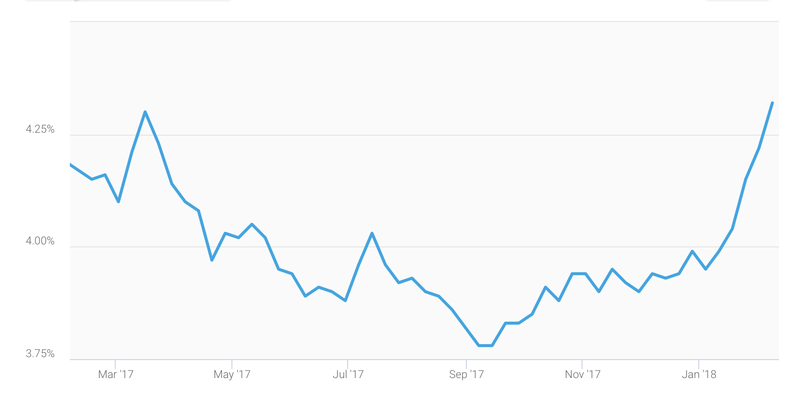 Rates haven't been that high since December 2016. This is based on the weekly mortgage industry survey conducted by Freddie Mac. The average rates for 15-year fixed mortgages and 5/1 ARM loans rose as well. Those are the three categories tracked by this survey. "The U.S. weekly average 30-year fixed mortgage rate rocketed up 10 basis points to 4.32 percent this week. Following a turbulent Monday, financial markets settled down with the 10-year Treasury yield resuming its upward march. Mortgage rates have followed. The 30-year fixed mortgage rate is up 33 basis points since the start of the year." The chart below, courtesy of Freddie Mac, shows average rates for a 30-year fixed home loan going back one year. As you can see, rates are higher now (on the right side of the chart) than they've been all year. This is not surprising to industry watchers and analysts. Last year, economists from the Mortgage Bankers Association and Freddie Mac were predicting that rates would rise gradually throughout 2018. Some forecasts suggested that the average rate for a 30-year mortgage would reach 5% by the end of this year. And that's entirely plausible, given this recent uptick in lending rates. So what's causing this recent rise in borrowing costs? Several things. Over the last year, the Federal Reserve has been gradually increasing the short-term federal funds rate. This can have an indirect affect on consumer borrowing costs. The Fed's policy changes, along with general economic improvements, are partly what's driving the rise in interest rates -- including those used for mortgage loans. All of this makes a good argument for buying a home sooner rather than later. Home buyers who postpone their purchases until later in the year could encounter higher mortgage rates. And when you consider the fact that home prices are still rising in most parts of the country, there's even more urgency.